A dominant first half from Sydney FC, which included eight shots on target, provided the base on which to build their match-winning performance. An own goal to Nick Ward along with a strike from Brendan Gan were enough to see off the Phoenix 2-0. In their penultimate game of the regular season Wellington Phoenix ‘keeper Danny Vukovic had his best performance in a Wellington jersey, but it was not enough for a team looking to secure their berth in the finals. With Stuart Musialik out injured, Seb Ryall started his first match as a defensive midfielder. Naturally a defender, it’s a position he’s performed well coming off the bench in the past few matches. 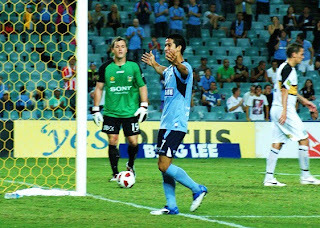 Early in the game, Sydney FC players Bruno Cazarine, Juho Makela and Nick Carle all had one on one’s with the ‘keeper but could not break the defense of Danny Vukovic. Hiro Moriyasu also had an early effort stopped, the number of saves an indication of Vukovic’s stellar match performance. In the 18th minute Phoenix had their first opportunity. A shot from Nick Ward from outside the 18-yard box after a nice one-two play was parried by Reddy, safely out for a corner. On 22 minutes Danny Vukovic yet again came to Wellington’s rescue. Moriyasu received the ball from a Nicky Carle backheel, but his resultant strike was blocked by an on-fire Vukovic. Against the run of play Marco Rojas showed some individual flair with a run down the right followed by a shot after 32 minutes. It looked as though the Sydney forward line would never find the net, every chance in the first half saved by the Phoenix ‘keeper. Despite a valiant effort from the ‘keeper, in the 55th minute Sydney FC found themselves a goal up. Carle received a penalty for a push in the back by Phoenix defender James Musa and he stepped up to take the shot. His effort eventually went in off the head of Nick Ward after the initial effort was saved. It was unfortunate for Ward, who until that moment was having a good match. Soon after the goal, Nick Carle was in the action yet again. Moments before he was substituted off Carle could have doubled the advantage, with the ‘keeper outside his box, Carle chipped from the sideline, but the shot went over the net. Carle’s substitute converted where he couldn’t. A rejuvenated Brendan Gan, fresh from his photoshoot with FHM, coolly converted a Cole cut-back in the 65th minute. 2-0 the final result. A crowd of 4732 witnessed Sydney FC continue their undefeated run in 2011, including a decent support from traveling Wellington fans. Confidence will be gained from tonight’s match, but there is plenty of work still to be done for a team hoping to regain pride in the Asian Champions League. The Phoenix now need to draw with or defeat North Queensland Fury, or hope that the Newcastle Jets stumble against either Perth Glory or the Central Coast Mariners.